← A Baby and Her Love for Walking. Thank goodness it’s Friday because it has been a VERY busy week and I am more than ready for the weekend! 1. Pampers Cruisers– Olivia is in a size 5. I always go a size bigger to avoid the dreaded ‘blowout’. When she was tiny, we tried Huggies and she had a reaction to them because she has sensitive skin. Haven’t switched back since. PS New Mamas/Mamas-to-be: the Swaddlers have a nice yellow strip that turns blue when it’s wet, I loved that (and miss it) the most! 2. Gerber Graduates Lil’ Crunchies– Olivia LOVES these. Loves loves loves. Seriously. If she sees that we’re buying her a new one at the store, she wants to eat them right away (I blame that on my dad who actually lets her get away with that.) She loves the cheddar ones, but because I honestly feel like I’m feeding her Cheetos (they smell just like them) I like to alternate between the cheddar and the veggie. Bonus points to Gerber because Dominic and I really like them, too! 3. Olivia the Pig– The show, the movie, the books. Olivia needs at least one dose of Olivia a day. We have all of her episodes recorded on our DVR and one of her bed time books is always an Olivia book. 4. Pampers Sensitive Wipes– We’ve been using these babies since the day she was born.I love them. I won’t lie though, we did try Huggies gentle care because they smell so good, but again, she got a really bad rash from them. Not. Okay. 5. Johnson’s Baby Bedtime Bath and Lotion (lotion not pictured)- Since we almost always give Olivia her baths at night, we stick to this one. It smells so good and is very gentle on our girl’s skin. 6. Playtex “The First Sipster” Sippy Cup– We have gone through a plethora of sippy cups and this one has definitely been the favorite. Olivia likes to squeeze the top of her bottles/sippy cups and the contents just pour out all over her, and the floor/bed/couch. Not the Sipster though. 7. Baby Einstein Great Barrier Crib Music Soother– It’s basically a sound machine that plays the sound of an aquarium. I like this one because it has a switch for just the water noise, the water and a light, just music, and music and a light. Lately, 9 times out of 10 we’ve been finding ourselves just using the water noise. It also comes with a little remote, so you can turn it back on once it turns off. However by the time it does turn off, Olivia is usually asleep. 8. Tommee Tippy Closer to Nature Bottles- I have exclusively breastfed Olivia since day one and when we finally introduced her to the bottle at 4 months (because I went back to work for a bit), we had a very hard time getting her to take it. My friend, Steph, took it upon herself to buy us these bottles and Olivia liked them! Once I became a stay at home mom, I never needed to use the bottle, but the once in the blue moon time that I did go out for a girls night, Dominic used them and she hardly gave him any fuss. We are slowly weaning her off of the bottle, so now we only give it to her at night, but we love them. And Olivia walks around with it at night holding it with one hand, and literally chugs it. It is hilarious and so cute all at the same time. 9. Eddie Bauer High Chair– Okay, how gorgeous is this sweet thing? The moment I saw it while we were registering for our baby shower, I knew I had to have it. It really was love at first sight. The dark wood makes it look so classy, the top tray comes off so you can slip it easily into the dishwasher, there is a little shelf to store bibs/bowls/whatever your heart desires right below the seat, and speaking of the seat, it feels pretty darn comfortable. Dominic and I are guilty of eating our meals in front of the TV in the past, but now we try to make sure that every meal, we sit her in her high chair and we eat as a family (or just her and I when he is at work). Dominic’s parents used to make him come home every night for dinner when he was younger, no exceptions, and he said he really liked it. And I really like the idea too, and there’s no reason why we can’t start now! 10. Fisher Price Little People Disney Princess Song Palace (I feel like these titles just keep getting longer…)- We keep two sets of toys in the house, one on the middle floor where we spend most of the day, and then a set in her room that she mainly plays with only at night so that she can associate them with bed time. She got this castle as a birthday gift from my sister (her godmother) and it is so cute. She has each and every princess and prince to go with (all sold separately) and carries them around the top floor like they are her little babies. She plays with them every night before she goes to sleep, dances to the music that the castle plays, and kisses all of the little people goodnight. Bonus points from me because it’s Disney. And that’s that! I know that number 9 was kind of a cop-out, but this list was harder to come up with than I thought! 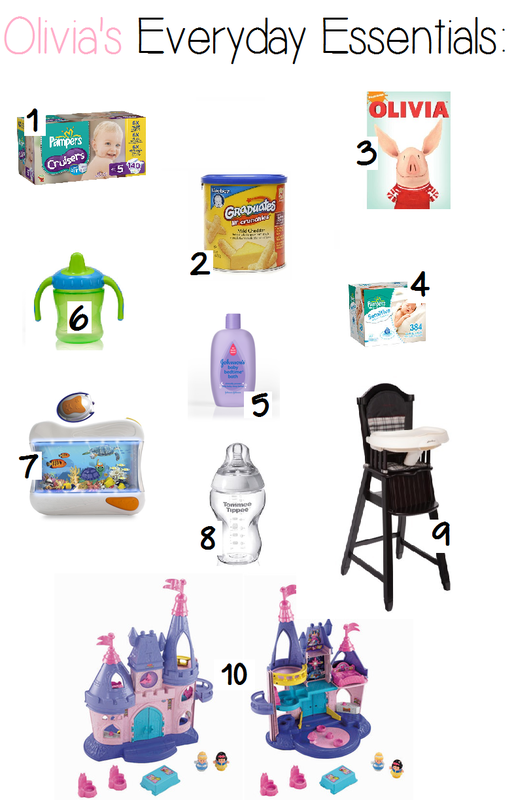 What things does your little one use every day?